Macroom (Maigh Chromtha –‘crooked plain’ or ‘meeting place of followers of the god Crom’, referring to druids) (pop. 3000), an attractive market town set amidst scenic surroundings on the River Sullane, principal tributary of the River Lee, likes to call itself “the capital of mid-Cork” and “the town that never reared a fool“. Natives of the town are called Macrompians. Macroom has colourful streets lined with traditional shopfronts; (Photo by Postdif). The Briary Gap Cultural Centre, a concert and drama venue, screens interesting films regularly. There are several good pubs and eateries in Macroom, notably MacCarthy’s Restaurant & Antique Shop and the Muesli Café. Accomodation facilities range from the centrally located Lee Valley Hotel (popular for wedding receptions, with a nightclub often used for stag / hen parties) and the family-run Castle Hotel to numerous B&Bs. Macroom’s main square, lined by houses dating from c.1750 and imaginatively called The Square, is filled with colourful stalls every Tuesday for the weekly Farmers’ Market. The castle was taken on 10th May 1650 at the Battle of Macroom, when a Royalist force led by David Roche was utterly routed by a Parliamentarian force under Roger Boyle, Baron Broghill; five or six hundred Irish soldiers were killed, including the prisoners Boyle had taken, except for the Castle’s nominal defender, Archbishop Boetus McEgan, who died heroically the next day at Carrigadrohid. The castle was granted to Admiral Penn, father of William Penn, who spent part of his childhood here, and later passed via the Hollow Sword Blade Company into the hands of the Bernard family of Bandon. By the early C20th the castle was in the ownership of the glamorous Olivia, Lady Ardilaun (née White), sister of the last Earl of Bantry, who married Arthur Edward Guinness MP, heir of the brewing family. When Macroom Castle was burnt (for the fourth time) in 1922, Lady Ardilaun gave the remains to the Irish people. The gaunt ruin was mostly demolished in 1966 for safety reasons. The most impressive view of the almost intact west front of the keep is from the Sullane Bridge at the western end of town. The Castle Arch admits walkers to large demesne parklands, featuring beautiful riverside walks among mature oak and beech trees. Unfortunately, there is also a golf course. From 1919 to 1921, Macroom was the County Cork base of the British Auxiliary Division, 17 members of which were killed by the local IRA under Tom Barry at the Kilmichael Ambush, which took place in the townland of that name, just south of the River Lee, on 28th November 1920; a description compiled from various sources can be read here. British reprisals were savage. The former Church of Ireland edifice on Castle St. is derelict; there is some talk of restoration as a civic amenity. The atmospheric churchyard contains several interesting graves (Photo by Richard Fensome). The Museum housed in the former Rectory has a collection of West Cork Hooded Cloaks, the normal rgional female attire within living memory. Macroom has hosted major musical events ranging from the formerly annual Mountain Dew Rock Festival, which tended towards the Heavy Metal end of the spectrum (I attended twice in the late 1970s and enjoyed Whitesnake immensely) to more recent Country & Western stomps. There are many Holy Wells, churches and other sites associated with visionaries and healers in the area. 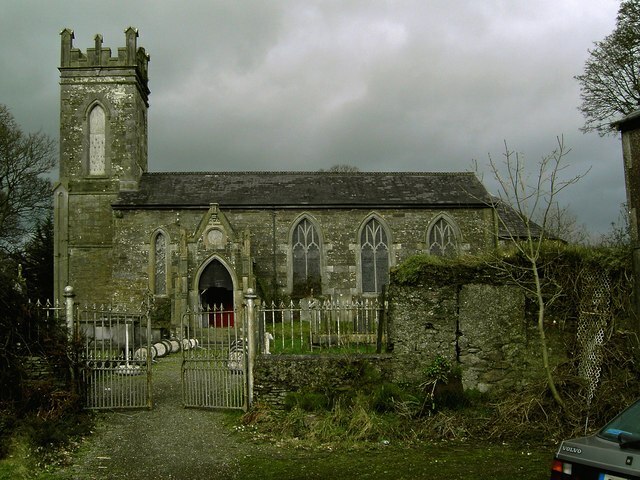 Carrigastya, north of the town, is the location of a Famine Graveyard where paupers who died in Macroom’s Workhouse were buried; it was still in use as recently as 1937. The Weirs is a local beauty spot about a mile from the centre of Macroom on the River Sullane, which flows eastwards to meet the River Lee at Two Mile Bridge. Bealick / Bealach Leachta (“Stone Crossing”), at the confluence of the Rivers Sullane and Laney, is the site of Leacht Mahon, a large (ugly!) monolith, one of three stones raised to commemorate an important victory by Brian Boru in 978 AD against a mixed army of Norsemen and O’Mahony clansmen under their chieftain Maolmuidh, who had killed Brian Boru’s elder brother Mahon, king of Munster. It has been described as one of the “fiercest engagements ever fought in Muskerry“. Fulfilling a curse, Maolmuidh was buried under a harsh wind on the north side of the hill where the sun never shines. 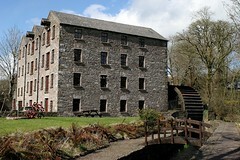 Bealick Mill, now an attractive Heritage Centre, was built in 1797 by the local Harding landlord family of Firville, who later used the Macroom-Cork Direct Railway to transport produce for export and provided considerable relief during the Great Famine. It enabled Macroom to have electric street lighting as early as 1899. Francis St. Aubyn Horgan of Firville used it in conjunction with a nearby foundry to manufacture manhole covers, road signs etc. up to 1964. The original big millwheel, said to be the only one of its kind left in Ireland, still generates electricity. (Photo by rymus). Ummera Forest commands great views of rich farmland, the Sheehy Mountains and the Lee River Valley with its lakes, streams and rolling hills. It is also a good spot for birdwatching. The Gearagh (An Gaoire – Old Irish for “wooded river”), just south of Macroom, is an intricate tangle of narrow channels and many branching streams encircling a maze of islands covered with oak trees. Drowned stumps projecting from the water give the place a sinister air, reminiscent of an alligator swamp. This is the only remaining alluvial forest in the British Isles and probably Europe west of the Rhine. Investigated by famous naturalists and scientists since the C19th, much of the original area was nonetheless destroyed in 1954 when a vast number of oaks were felled to make way for the reservoirs to drive the electricity generating station at Carrigadrohid. However, a remnant of the woodland remained and in 1987 the area was declared a statutory nature reserve. The Gearagh’s combination of wetland and woods is of great natural importance as a habitat for very rare groupings of plants. The islands shelter otters, pigmy shrews, frogs, smooth newts, herons, wild duck, snipe, woodcock, curlew, lapwing and swans; during the autumn and winter months migratory birds arrive in vast numbers. There are several well signposted walks through the Gearagh. These are necessary, as it is easy to get lost. It is said that a thousand people could spend a week in the Gearagh without meeting each other. Due to its isolation, the Gearagh was long notorious as a place of secret activities, notably the illegal distillation of poitin. Sean Rua na Gaortha was a famous local Robin Hood figure whose daring exploits and miraculous escapes are part of the folklore of the area. He was hunted continually by the Militia, but always seemed to elude them in his home territory and by all accounts lived to a great age and died in his bed.